The first large-scale age-map of the Milky Way shows that a period of star formation lasting around 4 billion years created the complex structure at the heart of our galaxy. The results will be presented by Marina Rejkuba at the European Week of Astronomy and Space Science (EWASS) in Liverpool on Tuesday, 3rd April. The Milky Way is a spiral galaxy with a bulge at the centre, thousands of light years in diameter, that contains about a quarter of the total mass of stars. Previous studies have shown that the bulge hosts two components: a population of metal-poor stars that have a spherical distribution, and a population of metal-rich stars that form an elongated bar with a "waist", like an x or a bi-lobed peanut. However, analyses of the ages of the stars to date have produced conflicting results. Now, an international team led by astronomers from the European Southern Observatory (ESO) have analysed the colour, brightness and spectral information on chemistry of individual stars to produce the age-map of the Milky Way. The team have used simulated and observed data for millions of stars from the VISTA Variables in the Via Lactea (VVV) infrared survey of the inner Milky Way and compared them with measurements of the metal content of around 6000 stars across the inner bulge from a spectroscopic survey carried out with the GIRAFFE/FLAMES spectrograph on the ESO Very Large Telescope (GIBS). Rejkuba says: "We analysed the colour and brightness of stars to find those that have just reached the point of exhausting their hydrogen fuel-burning in the core, which is a sensitive age indicator. Our findings were not consistent with a purely old Milky Way bulge, but require star formation lasting around 4 billion years and starting around 11 billion years ago. The youngest stars that we see are at least 7 billion years old, which is older than some previous studies had suggested." The results presented are based on the analysis of three areas of the VVV infrared map, which, combined, make up the largest area studied so far in the Milky Way bulge. In all three areas, the findings on the age range of the stars are consistent. Francisco Surot Madrid, the co-lead author of the study, says: "Previous studies have told us that the metal-rich stars in the bar are likely to be the youngest stars. Whilst we can't disentangle which star belongs to the bar/peanut or the spheroid component in the data we are using, our results tell us that the bar was already formed about 7 billion years ago and there were no large amounts of gas inflowing and forming stars along the bar after that." The ultimate goal of this project is the construction of a map of the star formation history of the entire Milky Way bulge. Co-lead author, Elena Valenti, says: "The final map will show us the star formation rate as a function of both age and metallicity for the stars across the bulge. 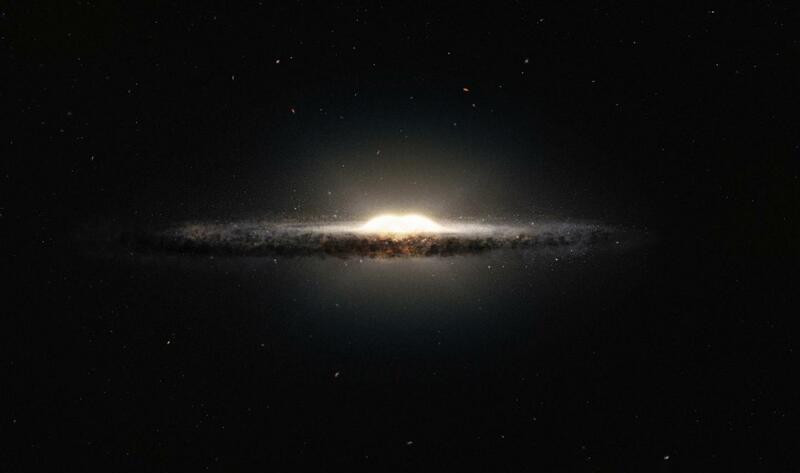 This will be an important ingredient in telling the complete story of the formation of the Milky Way bulge." The European Southern Observatory (ESO) is the foremost intergovernmental astronomy organisation in Europe and the world's most productive ground-based astronomical observatory by far. It has 15 Member States: Austria, Belgium, the Czech Republic, Denmark, France, Finland, Germany, Italy, the Netherlands, Poland, Portugal, Spain, Sweden, Switzerland and the United Kingdom, along with the host state of Chile and with Australia as a strategic partner. ESO carries out an ambitious programme focused on the design, construction and operation of powerful ground-based observing facilities enabling astronomers to make important scientific discoveries. ESO also plays a leading role in promoting and organising cooperation in astronomical research. ESO operates three unique world-class observing sites in Chile: La Silla, Paranal and Chajnantor. At Paranal, ESO operates the Very Large Telescope and its world-leading Very Large Telescope Interferometer as well as two survey telescopes, VISTA working in the infrared and the visible-light VLT Survey Telescope. ESO is also a major partner in two facilities on Chajnantor, APEX and ALMA, the largest astronomical project in existence. And on Cerro Armazones, close to Paranal, ESO is building the 39-metre Extremely Large Telescope, the ELT, which will become "the world's biggest eye on the sky".